You'll be £13.59 closer to your next £10.00 credit when you purchase Entertaining the Braganzas. What's this? Maria I of Portugal was a monarch with absolute power. William Stephens was the illegitimate son of a Cornish servant girl; he sailed for Lisbon at the age of fifteen to become one of the richest industrialists in Europe. The contrast between these two people could not have been greater – they were poles apart in every facet of their lives – yet they formed an unlikely friendship in the stifling formality of the Portuguese court. William, a man of genius, built up a thriving glass factory in a small village seventy miles north of Lisbon. Maria, the reigning queen of Portugal, spent three days here in the summer of 1788, sleeping for two nights in the house of an Englishman, a man who was not only low-born and illegitimate, but also a Protestant, a heretic in the eyes of the Portuguese. 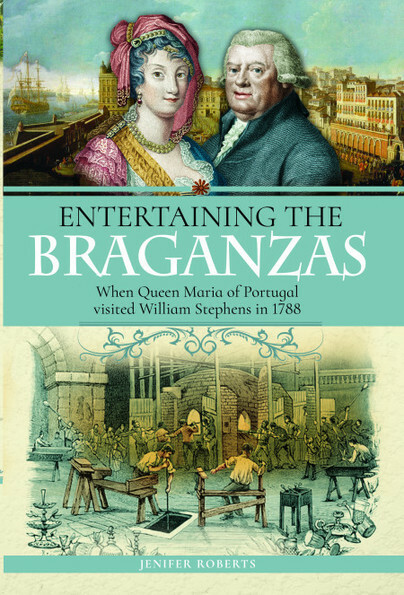 Entertaining the Braganzas is the story of this unique event in royal history, an intimate glimpse into the world of absolute monarchy, a snapshot of court life in the old Europe, just one year before the French Revolution began to change the face of the continent. It is also the story of two extraordinary people whose very different lives came together at a time of great upheaval in European history. This history restores full human dimensions to two figures contrasting figures. Queen Maria 1 of Portugal, remembered, if at all, for her piety and for going mad and William Stephens an obscure British merchant who amassed a fortune in Portugal. Both these figures were warmly loved during their lives. Queen Maria, sandwiched between the church and the legacy of the extraordinary and Machiavellian Marquis de Pombal, tried so hard to rule with justice and charity. William Stephens built up a glass industry and created a community in rural Portugal where the workers well-being was paramount – he recovered wasteland, cultivated vegetables, raised cattle, provided health-care and tuition on musical instruments. The workers put on concerts and plays, including Shakespeare, for their own entertainment. The paths of these two figures crossed in a rare carefree period for Maria and a triumphant success for William and his workers. Jenifer Roberts writes with historical accuracy and lively, entertaining detail and great illustrations. Portugal in the Eighteenth Century really comes to life. This book is excellent in detail and allows the reader to make their own judgement of how the Braganzas treated the population in general in what was still in effect, a semi feudal society, albeit within an emerging glass industry. Jenifer Roberts is the successful author of 'The Beauty of Her Age', 'The Madness of Queen Maria', 'Fitz: The Colonial Adventures of James Edward FitzGerald' and 'Glass: The Strange History of the Lyne Stephens Fortune'. She excels at in-depth historical biographies and has an extraordinary talent for bringing her subjects to life. 'Entertaining the Braganzas' is her first book for Pen and Sword.